Can I get Ranitidine online? It is possible to buy Ranitidine online. 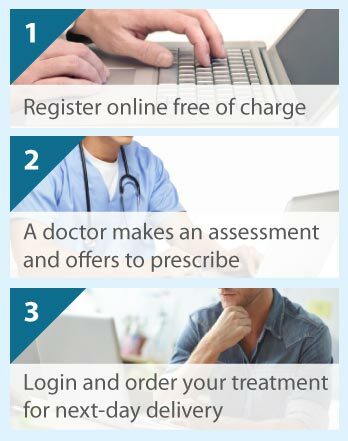 Simply complete an online questionnaire and we will make a quick medical assessment. If you order before 4.00 pm Monday to Friday then you should have the item the next day. Please note that we do not require a prescription from your doctor - we provide a private prescription for you based on your answers on our online medical questionnaire. Ranitidine may be prescribed for people who need treatment for stomach and other gut problems. These include peptic ulcers that occur in the stomach or duodenum (gut beneath the stomach), and conditions caused by too much acid in your stomach or food pipe, e.g. indigestion, heartburn, gastro-oesophageal reflux disease (GORD), reflux oesophagitis, and Zollinger-Ellison syndrome. Ranitidine is not only used to treat peptic ulcers but to prevent them occurring or bleeding. Ranitidine is classified as an H2-receptor antagonist (also referred to as an H2 blocker). These medicines reduce the amount of acid produced by the cells lining your stomach. Histamine (the ‘H’ in H2), a chemical naturally produced in the body, normally stimulates the cells to discharge acid. An H2 blocker prevents the cells from reacting to histamine, thus reducing the amount of acid made in the stomach. Normally, the stomach produces acid to help digest food, and it has a protective coating to stop it being damaged by the acid. If this protective coat is damaged then the acid can cause an ulcer (known as a peptic ulcer) to develop. Other people may suffer from acid flowing back into their food tube or oesophagus (GORD), which can irritate the food tube causing pain and a burning sensation (heartburn), and inflammation (reflux oesophagitis). By decreasing the quantity of acid produced in the stomach, ranitidine reduces the symptoms of heartburn, and enables the food tube to heal. Peptic ulcers are also able to heal and prevented from reappearing. Ranitidine is usually prescribed as a tablet or solution (syrup) but it can be administered by injection into a vein or a muscle if you cannot take it by mouth. Your doctor will tell you exactly how to take this medicine. The dose of ranitidine, and when and how long to take it, will depend on the problem that you have and its severity. Do not stop taking the medicine when you feel better as your symptoms may return; ask your doctor first. Ranitidine does not necessarily have to be taken with a meal. If you miss a dose, then take it when you remember; do not take it if it is nearly time to take the next dose, just take the next dose as planned. Never take two doses at once to compensate for missing a dose, and contact your doctor immediately if you take too much. Ranitidine can be used by children and adults but care needs to be taken with those over 50 years of age because of an increased bioavailability. It cannot be taken if you are allergic to ranitidine hydrochloride or the ingredients in the formulation. It is recommended that pregnant women or by women who plan to become pregnant or breast feed do not to take this medicine. Consult your doctor before taking ranitidine particularly if you have stomach cancer, have or have had stomach problems, poorly functioning kidneys, a rare blood disorder called porphyria, problems with your breathing or your immune system, are diabetic, or on a low sodium diet. Ranitidine solution contains ethanol (alcohol) and so may not be appropriate for children, pregnant or breast feeding women, or people addicted to alcohol or have liver disease, epilepsy or brain injury or disease. Let your doctor know if you are having an operation. It is important to let your doctor know about all medicines (including alternative therapies) you are taking, have recently taken or intend to take. Because ranitidine reduces the amount of acid in the stomach, it may affect the absorption of other medicines so they do not work as well. Particularly, mention drugs used to treat HIV, pain, swelling and arthritis, diabetes, fungal infections, heart and blood vessel disease, breathing problems, anxiety, epilepsy, sleep disturbances, and stomach ulcers. However, as always, please make a full disclosure of all current and recent drug therapies. Ranitidine may cause stomach pain, nausea, diarrhoea or constipation. Rarely, you may get a skin rash. Mention to your doctor that you are taking ranitidine because it can affect kidney or liver function test results. More rarely, headache, dizziness, blurred vision, inflammation of the joints, muscles blood vessels or liver, depression, confusion, hallucinations, hair loss, breast tenderness or discharge, or problems getting or keeping an erection are reported. A consultation with one of our expert doctors is available free online should you wish to discuss or are concerned about any stomach problems. Simply click on the Free Consultation button and complete the short online questionnaire to receive advice and treatment.